Red and green sprinkles, chocolate and popcorn make a happy winter treat. (NAPS)—Often defined as a time of quiet hibernation, winter is, in fact, one of the busiest times of the year. Consider the numerous celebratory occasions that begin with the harvest and continue on through the holidays and beyond, not to mention all the fun and frosty get-togethers prompted by skiing, skating and sledding. Keep popcorn on hand and you’re only minutes away from a satisfying and healthful treat. When friends drop in or as you make your way through neighborhood parties, pop up some wintertime fun by making these simple and delicious popcorn treats. The following recipes vary a basic method: melt chocolate, drizzle over popcorn and mix in flavorings or sprinkles. You can easily adapt these for any number of occasions—substitute holiday sprinkles with colors of your favorite Super Bowl team, red for Valentine’s Day, green for St. Patrick’s Day and so on. You’ll love having this quick “go-to” in your recipe file. 1.Place popcorn on a large baking sheet. Set aside. 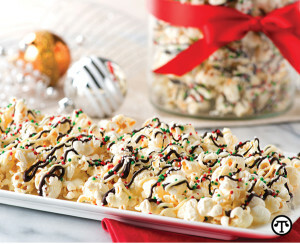 2.Drizzle popcorn with melted white chocolate and melted dark chocolate. 3.Scatter sprinkles over top. Let stand until chocolate is set. 4.Break into clusters if needed. Store in an airtight container for up to 2 weeks. 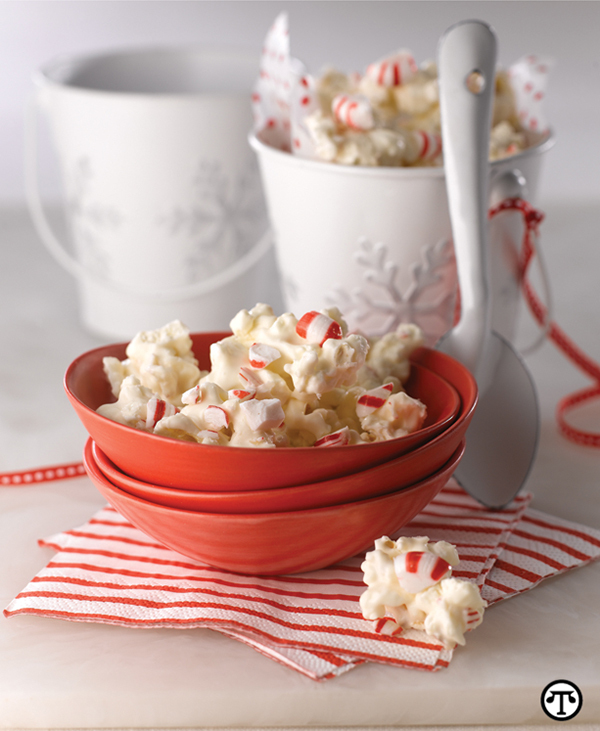 White chocolate and peppermint plus popcorn can bring warmth to the coldest night. 1.Cover a baking pan with foil or wax paper; set aside. 2.Place popcorn in a large bowl; set aside. 3.Melt chocolate in a double boiler OR according to package directions. 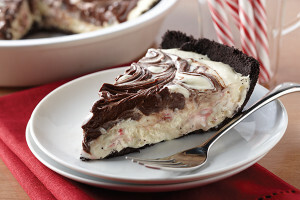 4.Stir in crushed peppermints after chocolate is melted. 5.Pour chocolate mixture over popcorn mixture and stir to coat. 6.Spread onto prepared pan; allow to cool completely. 7.When chocolate is set, break into chunks for serving. 8.Store in an airtight container at room temperature. Omit candy peppermints. Mix 1⁄2 cup dried sweetened cranberries and 1⁄2 cup sliced almonds with the popcorn. Pour chocolate over the mixture after it is melted. With these, you can create gourmet gifts for friends and neighbors, and munchable snacks for the whole family. You’ll find more creative wintertime recipes at www.popcorn.org. A prominent ingredient in both recipes, raw eggs are safe to use thanks to Safest Choice Pasteurized Eggs. * Undergoing an all-natural warm water pasteurization process, the risk of salmonella is eliminated inside the shell, making the eggs the ideal choice for raw and gently cooked consumption. Note: If desired, 3/4 to 1 cup dark spiced rum can be stirred into mixture after final blending. Cook the mixture gently to an internal temperature of 160 °F, stirring constantly. The cooking will destroy Salmonella, if present. At this temperature, the mixture will firmly coat a metal spoon. After cooking, chill the mixture before adding the rest of the milk and other ingredients. Note: Baked pastry crust or crumb crust such as chocolate or graham cracker may be used. *Editor’s note: This brand of pasteurized egg is not available in our area. 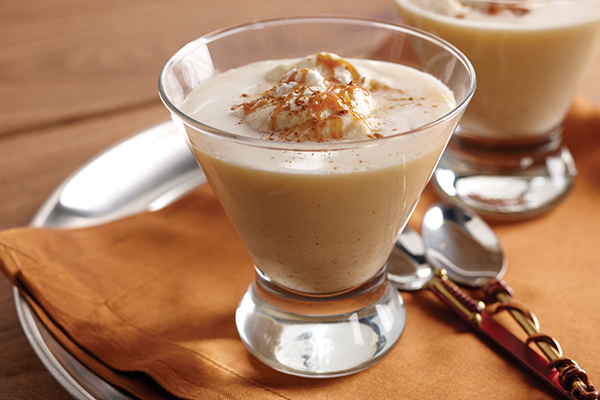 Use an alternative pasteurized egg product.